Check your wallets for cash this Fall as everyone is vying for your $100 drop on a re-release box set. The Band, a seminal rock band from the late 1960s/70s, performed and recorded at a small concert in New York City over the holidays in December 1971. ” in 1972, the concerts are being reissued as a box set Live at the Academy Of Music 1971. For fans of The Band, there is enough new material in “Live at the Academy” plus the DVD to tempt them to offer Amazon.com their credit cards. The DVD alone has 27 video recordings most people have never seen, ranking it close to The Band’s 1976 movie “The Last Waltz”. The complete track listing, including 4 live performances with Bob Dylan, follows the text in this story. It’s an impressive set-list of the best of The Band. The Band started their musical careers backing Rockin’ Ronnie Hawkins in the clubs along Yonge Street in Toronto , Ontario. Hawkins was a refugee from 50′s rockabilly music in Arkansas, USA. Hawkins decided the US market for his style of rock was too crowded so he set up shop in Canada. Ronnie Hawkins brought Arkansas native Levon Helm with him. Levon would become The Band’s drummer and its distinctive vocalist, although not the only member who sang. Joining Helm were Canadians Robbie Robertson (guitar), Garth Hudson (organ), Richard Manuel (piano and vocals) and Rick Danko (bass and vocals). After a slow year on their own, Bob Dylan hired the boys and they became his backing band in 1965 and 1966. It was the edgy rocking sound of The Band that drove folk fans of Bob Dylan crazy as he toured the USA and England. 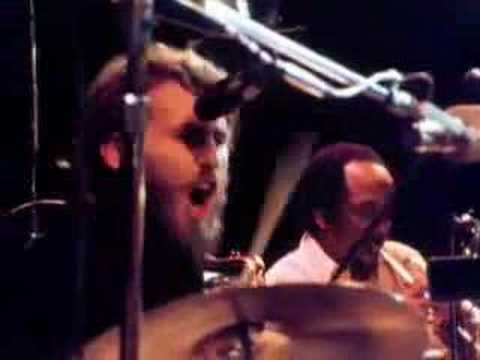 The booing got so bad, Levon Helm quit as drummer. This was a watershed time for rock and roll as Dylan and The Band moved away from psychedelic rock to roots or country rock, with Motown and Stax studio influences. Three years and three albums into their new careers as rock stars, The Band had stalled. Sudden wealth, drugs and alcohol ate away at their drive and creativity. Robbie Robertson tried to assert control of The Band at this point and added a New Orleans horn section led by Allen Toussaint, which freshened up the sound and repertoire. For 4 nights in December 1971, The Band with Allen Toussaint’s horn section and Bob Dylan as a guest wowed 3,000 fans per night at the NY Academy of Music. The 4 nights were distilled into the 1972 release “Rock of Ages.” Today there are only 2 members of The Band still alive. Levon Helm, Rick Danko and Richard Manuel have passed on. Garth Hudson is still performing and recording. Robbie Robertson is of course a solo performer and movie music composer. Robertson has worked closely with the producer to release this material. “Live At The Academy Of Music 1971&Prime is presented in a deluxe, 48-page hardbound book with previously unseen photos, a reproduction of Rolling Stone’s original Rock Of Ages review by magazine co-founder Ralph J. Gleason, an essay by The Band’s Robbie Robertson, and appreciations of The Band and the set’s recordings by Mumford & Sons and Jim James of My Morning Jacket. The collection’s first two discs feature performances of every song played over the course of the four concerts, and the New Year’s Eve soundboard mix on discs 3 and 4 puts the listener in the room for that entire legendary night: Uncut, unedited, taken straight from the master recordings and presented in full for the first time. will be released on September 17, 2013 and is available for pre-order today.